Today’s crankiness crusher didn’t happen until around 5:30 (hence the late post). I’d been on auto-pilot all day because I was tired from a busy, fun-filled holiday weekend–and my 21-month-old decided that it was time to “pway” from midnight-2 a.m. Ugh. Most of the day was spent in my PJs watching my son put together train tracks, puzzles, and his marble castle while my daughter took a 4 1/2 hour nap. Lucky her! Finally, around 5:30, I decided to turn on the “Party Favorites” music channel and got up and started shaking my booty and clapping. 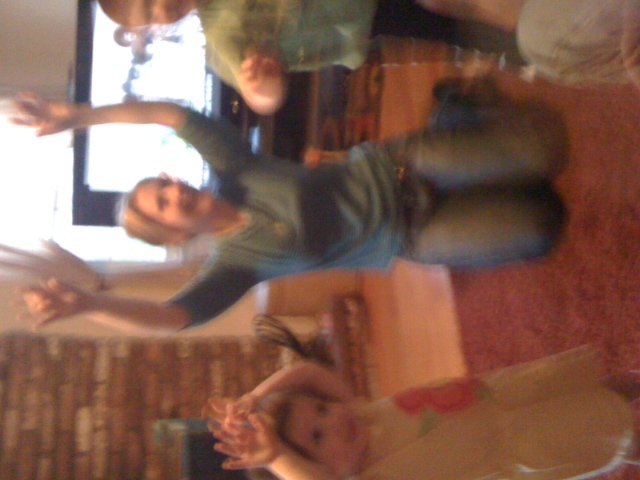 My parents had stopped by so they were just laughing at me, but the kids jumped right in and got jiggy with it. When my husband walked in, we were all dancing to “Mony Mony” by Billy Idol and cracking ourselves up. It was great to let loose and goof off. There’s something about dancing that frees your mind of worries–even if it’s only for a few minutes. As I type this, I just polished off a few handfuls of jelly beans and washed them down with a refreshing glass of white wine. I know this isn’t healthy behavior, but it’s putting me in a good mood! It also helps that we dusted off the kids for the eve–and I’m finally going to watch “The Social Network”. I hope that you did something today that got you moving in the right direction. But if you’re feeling kind of blah, I suggest pumping up some good tunes and dancing it out! Thats my girl. you sure know how to entertain. I loved it. great idea. LOOKING GOOD. LOL LOL.